I'm enjoying sewing patterns from other independent designers lately. Adelaide's wardrobe has definitely expanded recently with my spate of sewing. Gorgeous Holli from Hello Holli and I are doing a pattern swap this month. She launched her fabulous Blue Ridge Dress around the same time I launched my first pattern. The thing that struck me about this dress when I first saw all the pretty pictures of it, is how well it suits a young girl's shape or posture. The bodice line that comes up at the front is just perfect on a young girl who has a tummy that pops out (which Adelaide still does at 6 because she enjoys her food). Adelaide loves this dress. She keeps asking to wear it. When she loves a dress it often goes back on after bath-time and becomes a nightie as well. This pattern has beautifully written and laid out instructions and the fit was perfect. I simply measured Adelaide's height and chose the corresponding size. If you haven't tried a pattern from an independent pattern designer yet, the Blue Ridge Dress is a great place to start. This is a failsafe pattern that is easy to sew with lovely results. There are lots of ways you can combine fabrics with this pattern too. I've seen many finished Blue Ridge Dresses that are made up with 3 fabrics. I'm looking forward to making another with some shirting fabric and maybe white trim. Lots of possibilities. 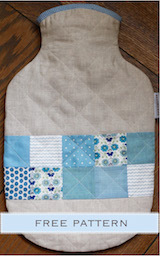 Holli has sewn the Adelaide sundress, so pop over to Holli's blog to see her Pattern Swap. Will has taken the boys to a friend's farm for a few days so I've had plenty of time for sewing. Adelaide has joined me in the attic studio and has made a skirt for her teddy. While tidying up fabric I came across this recent Liberty purchase and decided then and there that I had to make it into something. I made the Isabella variation. Did you know that when you buy the Isabella Flutter Sleeve Top you get a bonus second file that includes this version as well? It's a little warmer today so Adelaide was happy to explore the garden in summer clothes. She was wary of a pile of slaters we unearthed near the side gate so is looking a bit tentative here. I might even have enough of this fabric left over to make a little frilled bikini bottom. See more pretty garments here. Last night I headed up to my studio to make some clothes for Adelaide for summer. As I was cutting out a top using the Adelaide Sundress pattern, I was suddenly caught with the urge to sew someone else's pattern for a change. This pattern is from France with French instructions. So I just follow the pictures and make up my own construction plan. It was cold in our garden this morning so all photos are minus a cute smile. That just wasn't happening. The sleeves are a little too sticky-outy for my liking. I think a pom-pom trim or something with a little weight to it could be a useful addition, or a lighter fabric, (or maybe just a wash with fabric softener). All in all a very sweet pattern. 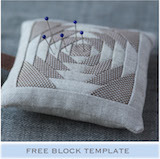 Join in the fun: see what other seamstresses around the web are sewing this week. 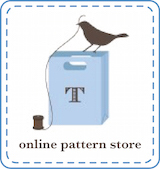 I have created a Facebook group for seamstresses sewing with Townmouse Patterns. I'd love you to share your finished garments in the group. It's also a place to ask questions and interact with other seamstresses. This is a closed group, so only members of the group will see your posts. They won't appear in your own feed which means you won't bore your non-sewing friends with photos of fabric and patterns! I really get so excited when I see my patterns made up by other clever creators, so for selfish reasons I'd love to see your photos. Another point to mention is that I am happy for my patterns to be used for small scale production. If you are selling children's wear at markets or elsewhere, please post about it in the group. I will do my best to help spread the word on Instagram and elsewhere.